It’s Wednesday which means that it’s time for a new fashion prompt from the Blended Bloggers! This time Katie from The Mishaps and Mayhem of a Solitary Life is up styling leggings and a scarf. Go to the Blended Blog to see her prompt. I struggled with this one, too, because my leggings are packed up for the summer. I do have a white pair but to be honest I hardly ever wear them. I feel that I don’t rock that look very well. I’m a bit old for white leggings, dontcha think? But because I’m a team player, here’s what I came up with. 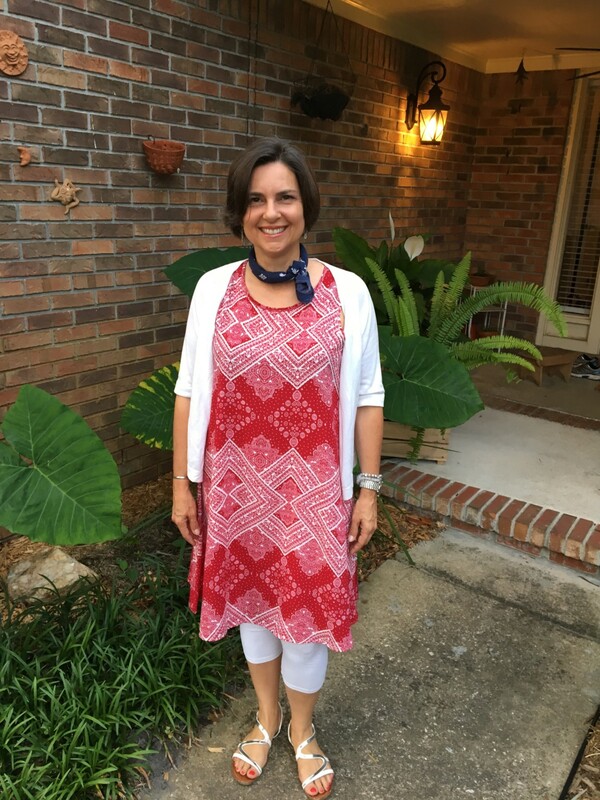 I purchased this swing dress after my shopping ban. It was $9 at Ross! For a scarf, I’m using a navy bandana for just a bit of blue. I tried it with a bit more blue but I don’t like this look as much. Maybe without the scarf? I liked this look enough that I decided to wear it on my plane trip to Arlington TX today. The dress is loose and comfortable, and the leggings will give me some extra warmth on my legs on the freezing cold plane. 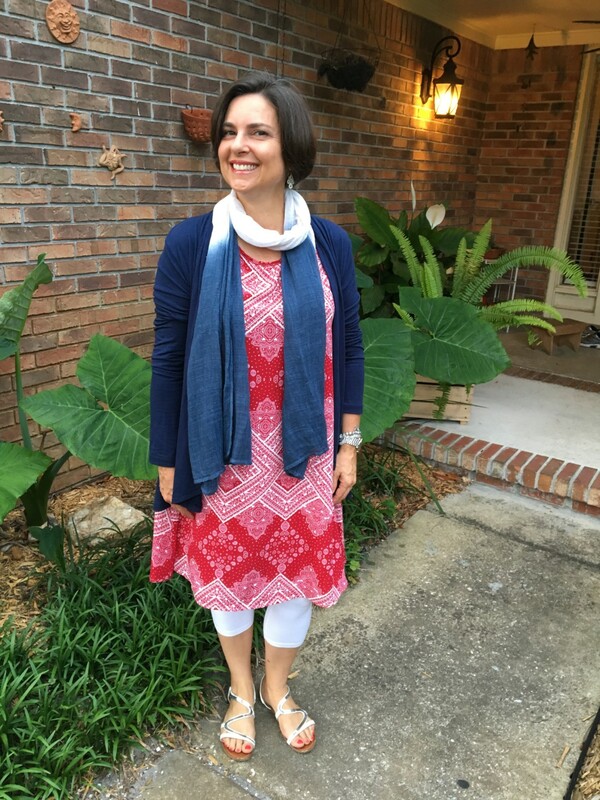 Do you wear leggings in the spring? Below are the links to the others. Check out their looks. You might find one you’ll want to copy! Check out last week’s looks. 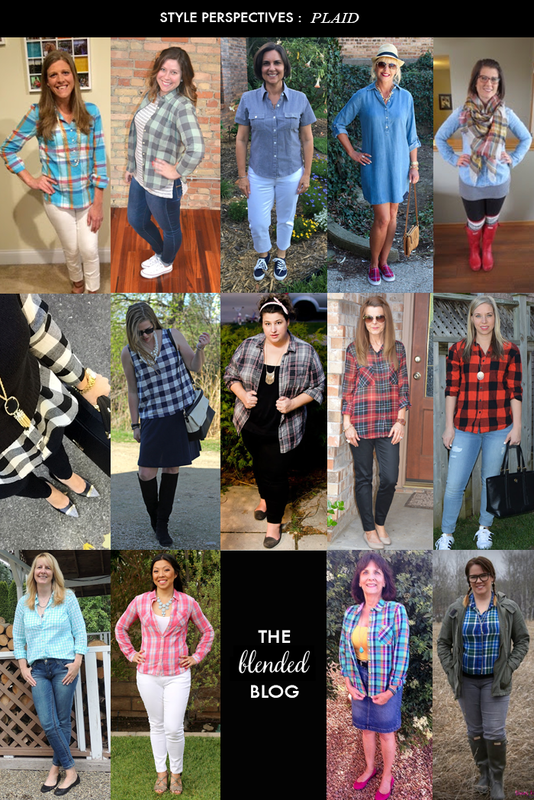 I guess I wasn’t the only one who wore gingham as plaid! Be sure to add your link up (above) if you are a blogger! 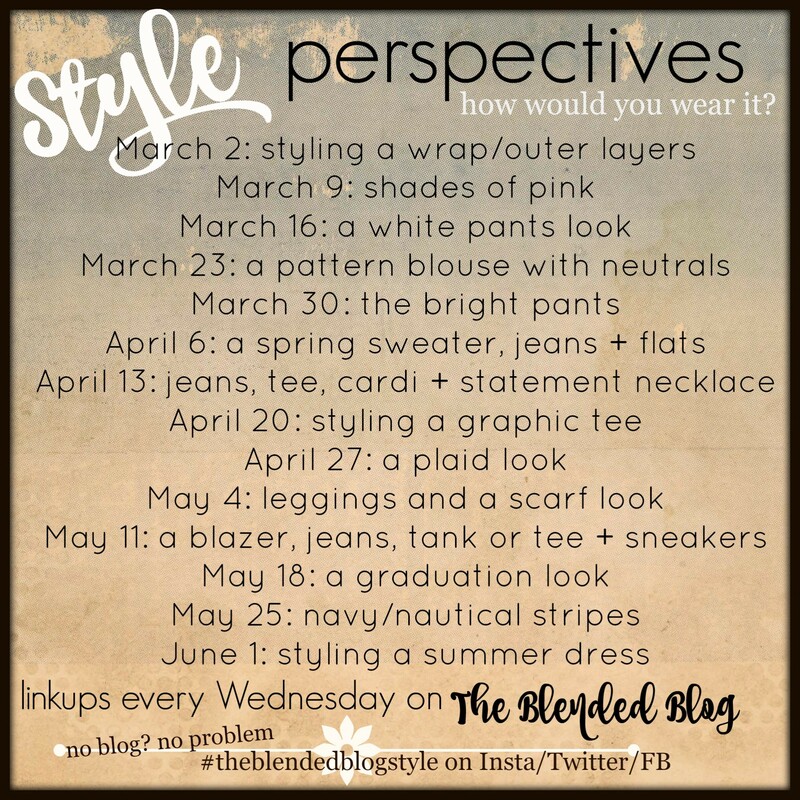 Or show us your stuff on social media using #theblendedblogstyle. PERFECT look for your trip today. Girl, it is time to get some mileage on those white leggings. I am at least 15 years older than you, if not 25, and imagine my horror at trying to style leggings. NO bueno. But we are team players. And you can absolutely add any of these looks into your regular wardrobe. Super duper stylish. Have a great time in the Lone Star State. Wish I was going to be in east Texas this weekend so we could have dinner together. Someday. SOON. Love you, dear one. Oh my dear Leslie!! I wish you were too! It would be fun to drink a margarita with you! Thank you for your kind words. I think this look works because the hemline is longer on this dress. I tried it with a different swing dress and it showed too much leg! Love the capri leggings- what a good option for hotter weather! That looks like such a super comfy traveling outfit! You don’t see white leggings very often but these are perfect under that dress. Traditional black would have looked funny, I think. And I often forget that I can wear leggings under dresses! I need to keep this in mind! I don’t often wear dresses for traveling because I usually have a carry on suitcase and trying to put that in the overhead bin + being short = disaster. But this is a longer dress and with the leggings I feel more covered. Bonus: I got to gate check my bag for free! Yay! A fellow neck scarf girl!! This looks so comfy and most beautiful!! You’re so cute and fun!! love a warm weather option, why didn’t I think of that?! Maybe because it’s not that warm where you are yet? That is exactly how I wore my white leggings before I lost them! I love the bandana look – very unique. I’m headed to TX. I feel like a cowgirl. Should have worn cowboy boots! Haha! Both you and Lisa wore it with a bandana…great minds think a like! I like the bit of blue in the first picture and the lots of blue in the second picture 🙂 Comfy is key in my world! We are bandana twins today – I wore one, too. I like how you styled the white leggings. Great idea! You look so pretty in red, white and blue! I do like cropped leggings this time of year. Thanks! I feel so patriotic! Haha! This is a cute look, Sheila! I’m glad you liked it and decided to wear it today. Have fun at the Homeschool Book Fair! Thanks Carrie! Are you anywhere nearby? I really like this look. Great outfit for a plane ride! I actually quite often wear leggings in spring under short dresses/tunics. And I’m pretty obsessed with bandanas at the moment and love yours with the outfit! I haven’t worn a bandana in years but something made me think of it! Thanks for stopping by Andrea!